We’re having a quiet half term, full of tea parties, games, coloured pencils, short walks, and visits to the library and playground. Little Flower has eaten most lunches under the kitchen table, pretending she’s Mrs. Tittlemouse. And now she’s wearing fairy wings, leaping from chairs in absolutely sincere attempts to learn to fly. I *love* childhood. We all feel like real homebodies, snuggling under blankets and being generally lazy. Perfect conditions for crochet! Purple is the shade of the moment here, with 10 more royal-hued hexies nearly complete. However, I’m starting to wonder what I’ll do with the edges to girly it up a bit. Remember, this is actually another Manly Scarf, I just enjoyed the stitch so much, and I loved this richly coloured yarn, that I decided to make one for myself. But I’m a girly girl, and I need something to prettify the ends. I’m not one for tassles or loose strands of yarn hanging down. I’m considering little pom poms, like those found at the lovely creJJtion, but will it work with chunky yarn? Hmmm...scalloped edge? Flowers? Suggestions please! Welcome to my new followers this week! I suffered some internet glitches this week, so I'm still catching up on your latest blog posts, bear with me! A big thank you to all the wonderful comments on my last post. I read and treasure every one of them! Rain rain go away ..... we've all really had enough now! I think a tiny little scalloped edge would look divine but it already looks beautiful anyway. 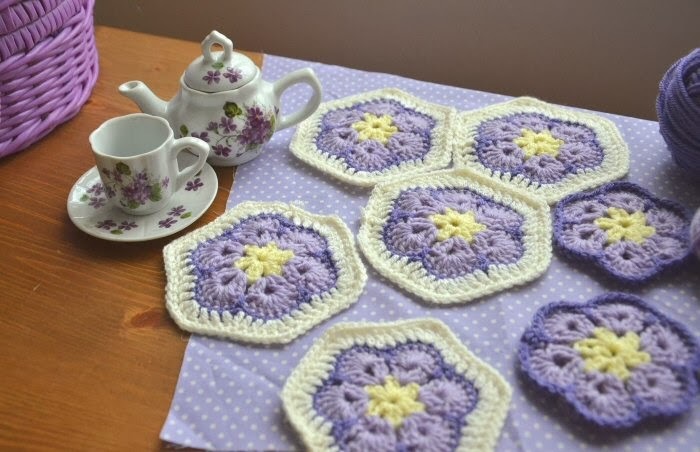 Loving the african flower hexies, they look lovely in purple shades. On my very long "to make" list too! 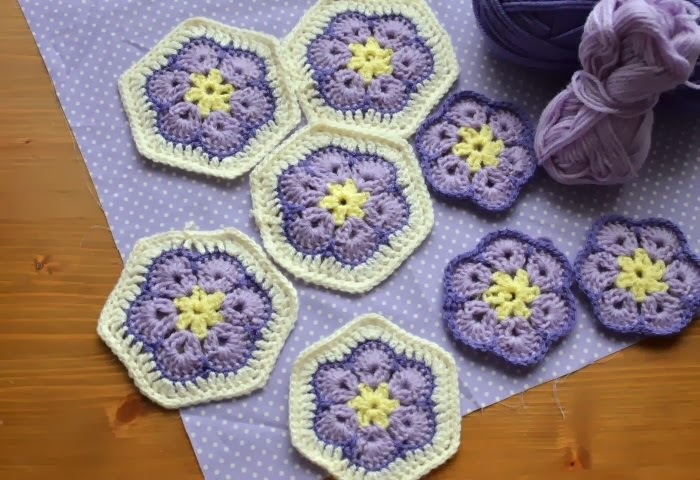 Love those gorgeous purple hexies! 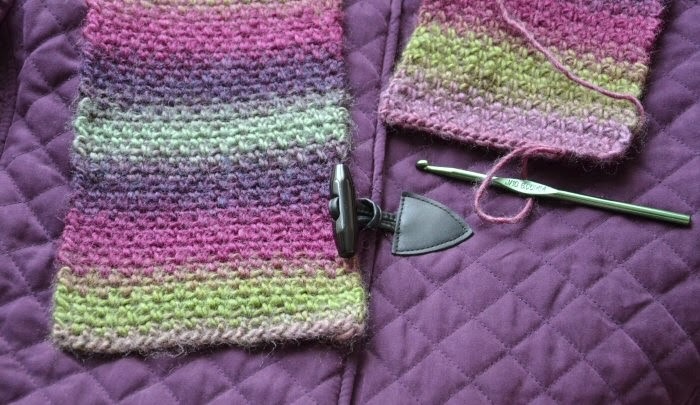 Scarf is looking fab, I am a big fan of a scalloped edge...but pom-poms would be cute too. The hexi's are lovely and the scarf is fab what about adding some beads to the ends. The hexes are gorgeous in purple Chrissie, and the scarf is coming along a treat - like Marianne I rather fancy the look of scallops on it; beautiful orchid but not so beautiful rain, although we could well do with some of it - you folks over there have been so greedy with it this year there's none left for us!!! It does sound like such an enjoyable time with the little ones - make the most of it for they grow up way too fast! 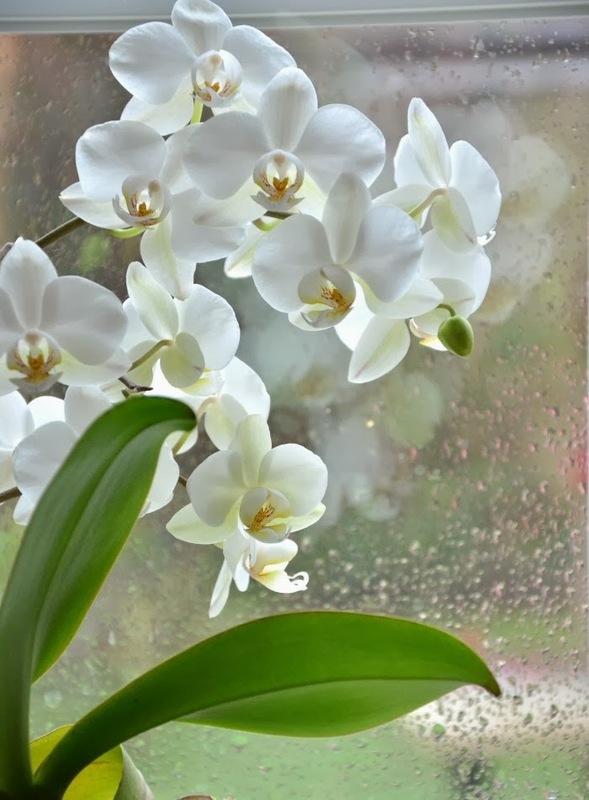 Love orchids and I adore the purple crochet too! I do like an ending to a scarf but hate fringing. The pompom scallop edging is absolutely perfect and I'll vote for that. Loving your purple African Flowers and your scarf is such a beautiful colour to. Enjoy your quiet and relaxing half term. I vote for pom-poms!! Always! I love the hexies! Perfect spring colors. Such a pretty scarf. I recently made one and edged it with a kind of scalloped/wavy edge. It was so easy to do: I just worked all the way around the edge doing sl st, dc, htr tr and htr all in 1 st, then back down the other side : dc, sl st. I would try a scallop or a picot edge for your beautiful scarf. I have never heard of garnet stitch before in crochet so I think I will have to google that one. It sounds like you're having a lovely break. The purple is beautiful; purple is my faaavorite color! Sounds like a wonderful half term. Love that scarf it is stunning, pom poms would be adorable. Sounds like we're having the same kind of week - (except I haven't got around to writing another post yet, so slapped wrist for me!!). Yep I'm liking the pom-poms idea for sure. I love your hexies; the color combination is so beautiful. The scarf is turning out very pretty too. 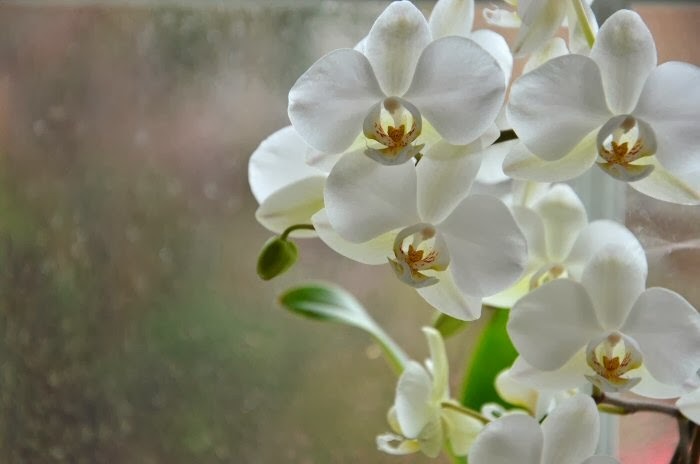 And the orchid is gorgeous! I love the colours in your scarf, and the lovely stitch! How about this pompom trim? I think it's so pretty! Beautiful scarf, I love the yarn, it's fantastic, and the hexes are great too. 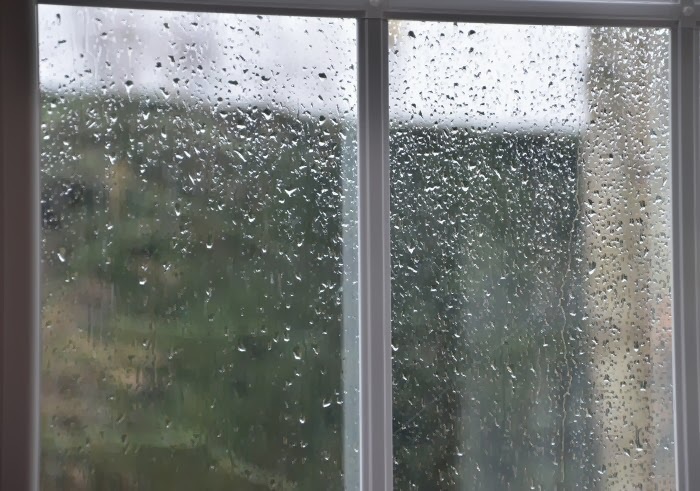 It sounds like you're all enjoying half term despite the rain. Very pretty, I'm loving the shades of purple. Love the colours in the scarf. How about crocheting some flatish flowers and appliqué-ing ( is that a word) to the top and bottom edges to girly it up a bit. Lovely colors for a beautill scarf... love the purple flowers...and your orchid ! The hexies are a lovely colour, as is your scarf. I've never used any of the multi-coloured yarns before, it's a lovely effect, might give it a try. Perhaps a picot or scalloped edge? Have a lovely weekend. Gorgeous hexies and that scarf … it's so pretty. I never cease to be amazed by self-striping yarn! As for an edging, I think it looks rather lovely the way it is but, if you're fancying an edging, my favourite would have to be a scallop or picot. I'm also a fan of a slip stitch and chain 1 in each stitch which gives a subtle rope look (I've edged by latest wristycuffs using it). We are gray and rainy today too. Love your bright and beautiful crochet. 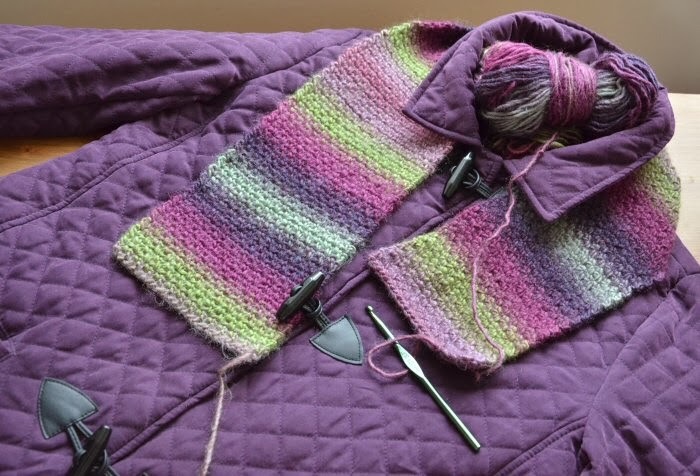 Love the colours of those pretty hexies and your gorgeous scarf too, Chrissie! Pompoms would be lovely! So much beautiful purple for the month of February whose birthstone is amethyst. It is my favorite color because my birthday is this month. I love your hexagons and that gorgeous scarf. Those african flowers are gorgeous. I have so many projects on the go I feel a little overwhelmed, I shall be glad when something is finished. You pictures are really beautiful. I LOVE the colors of those projects you're working on. They make me want it to be spring even more than I already do! So gorgeous! Stitching Sunday: Cross stitch? Moi?